2018 vs. 2019 Audi A8: What's the Difference? The update to the understated Audi A8 is more than skin deep. The 2018 Audi A8 large flagship sedan takes one last model-year ride before 2019's new generation arrives. 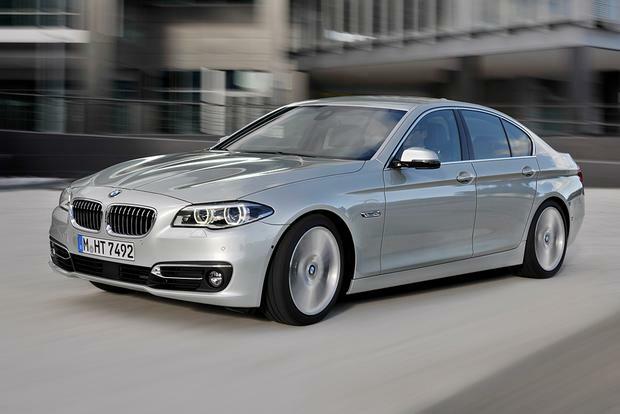 Want a big luxury sedan without paying big money? Check out our list of certified pre-owned luxury sedans for $50,000 or less. The 2015 Audi A8 is powerful, classy and fun to drive, but is it good enough to woo BMW, Benz and Lexus loyalists? Find out in our review. 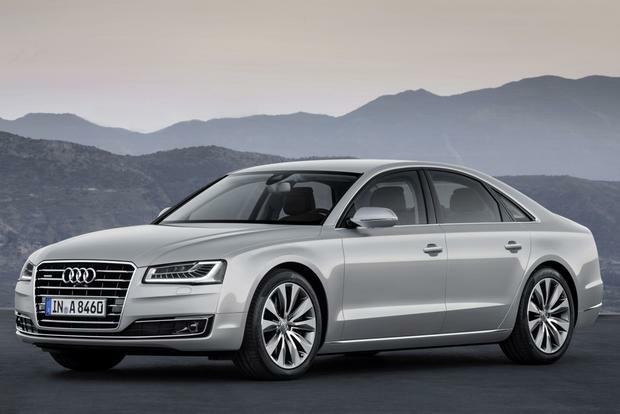 The 2014 Audi A8 has emerged as the driver's choice among full-size luxury sedans, and there are two reasons for that. First of all, the A8 feels lighter and more responsive than its rivals, and its standard quattro all-wheel drive provides tenacious grip in corners. But the A8 is also a winner under the hood, where there are no fewer than four excellent engines to choose from. Our favorite last year was the 4.0T model's 420-horsepower V8, but this year a new TDI turbodiesel V6 joins the fold, and its combination of torque and fuel efficiency is tough to beat. In other respects, the A8 is -- not surprisingly -- a stupendously gratifying car. Its interior is one of the finest in the world (particularly in the long-wheelbase L model with its first-class rear accommodations), and its technology offerings are exceptional. 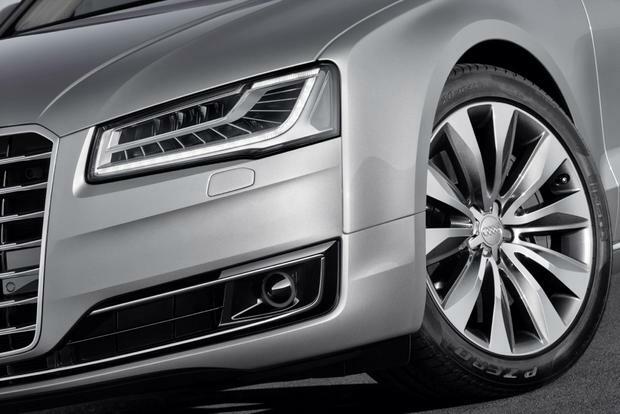 If we could change one thing about the A8, we'd add a little more visual interest to its conservative exterior. But hey, some people would rather fly under the radar. At any rate, for those who prefer driving to being driven, the 2014 Audi A8 is a tempting proposition indeed. The A8 receives a new turbodiesel V6 engine option (long wheelbase only) and some additional standard features, including keyless entry/ignition and power-closing mechanisms for the doors and trunk lid. 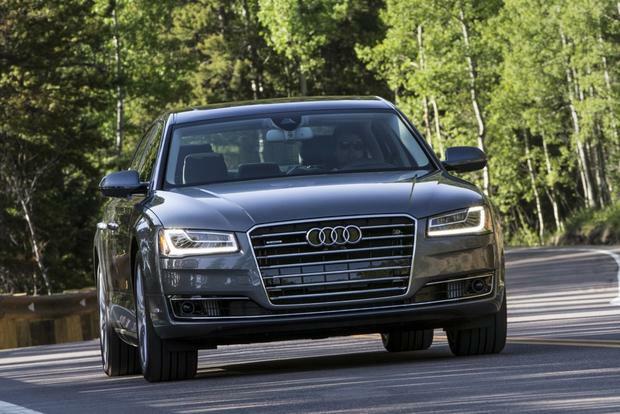 All-wheel drive and an 8-speed automatic transmission are standard on all A8 models. The regular Audi A8 and A8 L start with a supercharged 3.0-liter V6, known as the 3.0T, that pumps out 333 horsepower and 325 lb-ft of torque. The Environmental Protection Agency rates fuel economy at 18 miles per gallon city/28 mpg highway. Next up is the new 3.0 TDI option, a 3.0-liter turbodiesel V6 rated at 240 hp and 406 lb-ft. Fuel economy stands at an impressive 24 mpg city/36 mpg hwy. The twin-turbocharged 4.0-liter V8 (4.0T) generates a robust 420 hp and 444 lb-ft of torque. Fuel economy doesn't drop as much as you might think relative to the 3.0T, checking in at 16 mpg city/26 mpg hwy. If for some reason the 4.0T doesn't feel like quite enough, you can step up to the A8 L W12, which is motivated by an unusual 6.3-liter W12 engine that makes 500 hp and 463 lb-ft of torque. However, the W12 returns just 13 mpg city/21 mpg hwy. The 2014 Audi A8 is offered in three versions: A8 (short wheelbase), A8 L (long wheelbase) and A8 L W12 (long wheelbase with the W12 engine). The base A8 3.0T ($75,995) comes standard with the supercharged V6 engine; 19-inch alloy wheels; adaptive xenon headlamps with LED running lights; LED tail lights; an adaptive air suspension; Drive Select, which provides electronically adjustable steering, suspension and throttle settings; power-closing door and trunk mechanisms; keyless entry with push-button ignition; a sunroof; leather upholstery; dual-zone automatic climate control; 18-way power heated front seats; a power tilt-telescopic steering wheel; Bluetooth; a Bose audio system; and Audi's Multi-Media Interface (MMI) with an 8-in power-retracting TFT display screen, full iPod integration, twin SD-card slots, mobile Wi-Fi capability and a navigation system with Google Earth street views. The A8 4.0T ($84,795) has the twin-turbocharged V8, along with different wheel styles and other minor changes. The A8 L 3.0T ($79,695) reverts to the supercharged V6, but gains a handful of special standard features, including quad-zone climate control and extended leather upholstery. 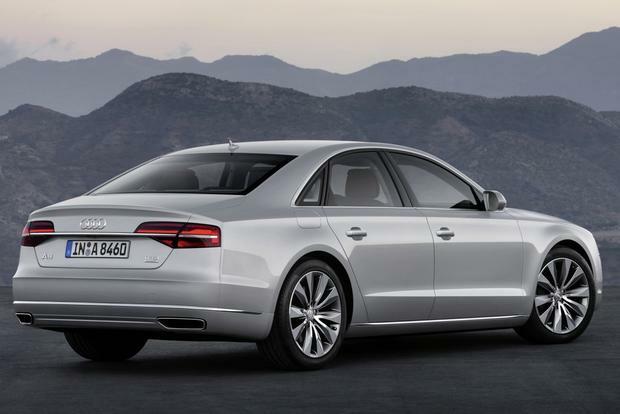 The A8 L 3.0 TDI ($83,395) and A8 L 4.0T ($88,495) add the turbodiesel V6 and the twin-turbo V8 respectively, but otherwise they are equipped similarly to the A8 L 3.0T. The A8 L W12 ($136,795) boasts the 12-cylinder engine. In terms of features, this model has basically everything but the kitchen sink, including 20-in wheels, full LED headlights, a heated steering wheel, 22-way power heated and cooled front seats with a massage function, two rear seating positions instead of three and a rear DVD entertainment system with twin 10-in screens. Many of the A8 L W12 model's features are available on lower trims as options. The L models are eligible for further high-roller upgrades such as a refrigerator, cooled and massaging rear seats, and a passenger-side executive rear seat with a power footrest and auxiliary front passenger seat controls. Also offered are a 360-degree parking camera system, quad-zone automatic climate control, a Bang & Olufsen audio system, adaptive cruise control and a Night Vision collision warning system. There is also a Sport package (for the short wheelbase only) with 20-in wheels, a sports rear differential and the 22-way power seats with exclusive stitching. The short-wheelbase A8's back seat has a relatively low bottom cushion, so there's not the robust thigh support that Hyundai gets exactly right in the Equus, for example. The L models solve this problem by providing lounge-all-day legroom for their lucky rear passengers. 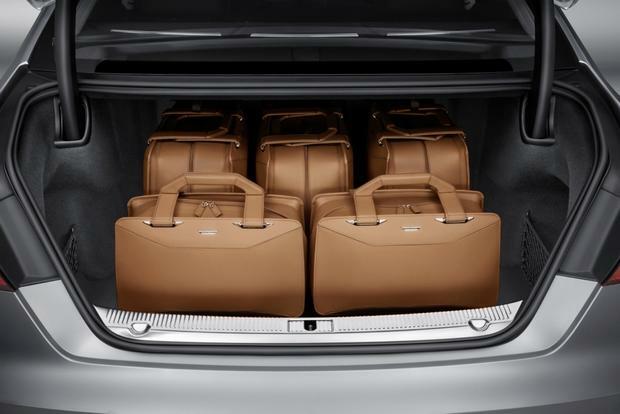 The A8's trunk is definitely on the small side at 13.2 cu ft. Fitting in a few golf bags is more difficult than it should be in a large luxury sedan. 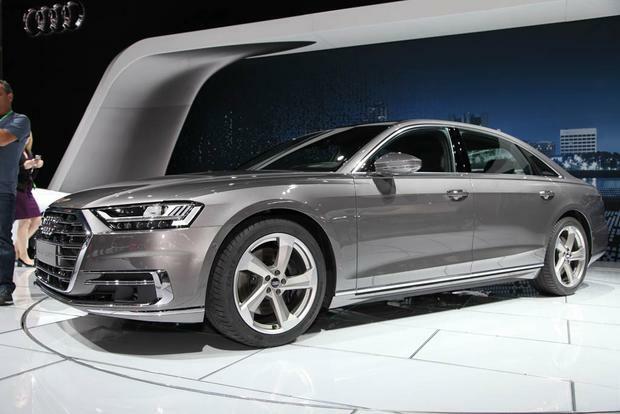 The 2014 Audi A8 comes with standard stability control, 4-wheel anti-lock disc brakes, active front head restraints and 10 airbags (front, front side, front knee, rear side, full-length side curtain), as well as a smorgasbord of advanced safety technologies. The A8 has not been crash-tested in the Unites States. Leaving aside the maximally opulent offerings from Rolls-Royce and Bentley, the A8 might have the nicest cabin in the automotive world. The materials used are uniformly superb, and practically everything you touch has an expensive, precision-engineered feel. The 8-in power-retracting MMI display screen is a beauty, especially when you call up Google Earth via the navigation system to get a 3D street view of your destination. The A8's front seats are one of the few interior features that don't meet or exceed expectations. They're very comfortable, no doubt about that, but even the optional 22-way chairs don't have wow-factor features such as the S-Class vehicle's active side bolsters, nor can they match the all-around excellence of the 7 Series' multicontour chairs. The engines are all satisfying in their own ways. The supercharged V6 is remarkably potent for such a small motor, while the turbodiesel V6 isn't much slower and delivers exceptional fuel economy. The twin-turbo V8 is the stuff of dreams for those who appreciate both speed and subtlety -- it's strong, smooth and utterly seductive. And although the W12 doesn't offer much of a performance advantage over the V8, its unique noises and character make it a worthwhile experience for those with sufficiently deep pockets. Like all driver's cars worthy of the title, the A8 has a way of shrinking around you at speed, making most rivals feel like the land yachts they are. The optional sport rear differential makes the A8 even more responsive, but the standard quattro system is already a performance plus with its 40/60 front/rear power split. 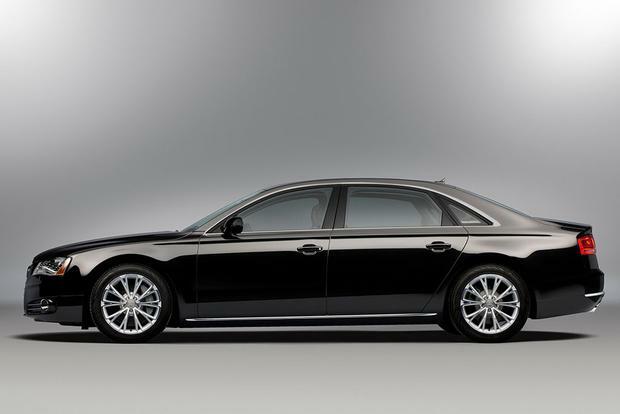 Thanks to the air suspension, the A8 has a smoother ride than lesser Audis. Still, if you want the 20-in wheels, make sure you're satisfied with the ride quality that they provide on rough pavement. Road noise can be an issue, as well. BMW 7 Series -- BMW's boss sedan gives the A8 a run for its money in driver engagement, and it has a fantastic selection of engines to choose from. Mercedes-Benz S-Class -- The new S-Class has no sporting pretensions to speak of, but it does have arguably the most imposing presence of any executive sedan. And its V12 engines blow away the A8 model's W12. Porsche Panamera -- The A8 might be the best executive sedan to drive, but if you broaden the field to include hatchbacks, the Panamera's athleticism is peerless. The base A8 4.0T is amazingly capable and well-equipped for the price. We're even tempted to call it a bargain.